Are you in search of a worry-free way to keep your pool warm without adding so much to your utility bills? Pool cover reels might solve your problem. The best solar cover reel is designed not just to keep heat but to keep your pool warm without adding too much to your power consumption. They also help keep the pool cleaner because they keep debris at bay. 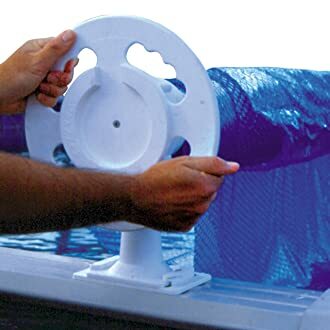 If you have plans on buying the best pool cover reel, this buyer’s guide can help you. Solar pool covers primarily act as a pool heater by harnessing sunlight and preventing the heat from escaping. Some factors that you need to consider when choosing include pool size, price range, and preferences. After you determine the different elements, deciding which pool cover roller to buy is easy. The first thing you need to consider is the pool size. Make sure you the get right size for the pool cover. If you purchased a smaller cover, you might not be able to warm the pool efficiently. Choose a light colored pool cover. Blues and darker colors may look appealing over the water, but if what you’re after is functionality, we suggest that you use clear protection because it allows the sun’s rays to penetrate. The black shield might heat up fast, but its effect is not as long-lasting compared to transparent covers. Recommended is the solar cover with air bubbles. The bubbles separate the material from the water and help the sunlight penetrate fast. Strengthened UV-stabilized polyethylene in particular is quality material. It is stronger and will last longer. Without the UV stabilization component, the cover will deteriorate faster when exposed to the sun for prolonged periods. Solar pool covers’ prices can vary greatly. Manually operated pool cover with just on and off function is much cheaper. An automatic pool cover with a small motor and has a roll to pull the cover in and out is a bit pricier. There is also a semi-automatic cover with a small engine, but one or more individuals are guiding the cover. It is the type of solar pool cover float on the pool’s surface. The cover prevents evaporation of water as it keeps the water heated for a longer. This type of cover has several layers of vinyl connected to each other and in between, there are air pockets. This design prevents the transfer of heat from your pool into the air. It is somewhat similar to bubble wrap where bubbles trap the heat. Thus both transfer heat to your water as you ensure little escapes. Many people prefer this kind of pool cover. It is the newest type of pool cover on the market today. It functions by floating a dispenser in the pool. It contains non-toxic, liquid pool chemical that floats on top of the water. It traps solar energy. Because it is non-toxic, it is safe to swim in the pool. Just lay the cover over the water of the pool. But, there are things that you need to keep in mind. The pool cover should fit perfectly into your swimming pool. It can be achieved by putting it on the pool surface and then cautiously cutting off any extra pieces, to ensure a perfect fit. If the cover is too big or hangs over the sides, it might not trap the heat efficiently nor warm your pool correctly. Also, use the cover as much as you can while you are not using the pool. It means that you should always keep the pool covered at night especially since this is the time when the heat usually escapes. Now that you are aware of the things that you need to consider when buying a pool cover reel, it is now time to choose the right product. 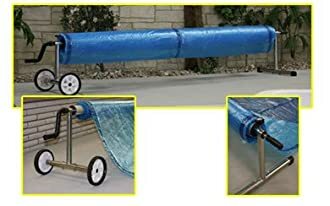 To help you decide which the best pool cover reel is, we reviewed 9 in-ground pool covers and 3 above ground pool covers. Note that while heating and energy conservation are typically the main function of these pool covers, they can also help slow down water evaporation. Keep in mind that when left alone, the entire water content of the pool could evaporate in just one season. If your goal for buying a pool cover is water conservation, you might want to be careful about the pool filter you use as well. A cartridge filter is more effective than sand filters and DE filters in that regard. Finally, keep in mind that solar pool covers work in two ways: 1) by preventing evaporation and 2) amplifying the sun’s heating effect. So using the right pool filter is also crucial in maintaining pool temperatures. The product has been designed for optimum durability because of its sturdy construction. It is rust-free and requires minimal maintenance. The Best Choice Products Cover is a beautiful handcrafted product which ensures maximum efficiency. This cover is perfect for pools with 17.5 feet to 21 feet in length. Putting a cover on your pool is a big favor you will do for yourself. It will not just improve the look of your pool, but it will also help you save some money that should have been used for heating the water. Some complaint on the Velcro used to attach the straps to the reel does not stick well to the aluminum. The Sun2Solar cover reel is a durable reel that offers you pool cover in various shades. It is made to cover up to 20 feet. You can choose the shapes and size that you want. It comes with large wheels to make it easier for you to roll the cover after using it and to unroll it when you need to. The inner tube is around 3.25 to make it even stronger when holding the cover. The cover will not drag because it has a significant clearance from the ground. If you own an 18 feet pool or smaller, we recommend you buy the Kokido Stainless Steel Reel. It has a stainless steel rust-free finish which makes it very durable. It has a strap that will hold the cover in position and a crank to roll the cover fast. It protects your pool from falling debris. 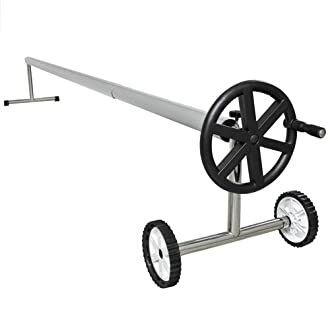 This cover reel is perfect for pools from 12 to 16 feet. It is triangular to help strengthen the reel and prevent it from tipping over or sliding into the pool. All the needed parts are included in the package, so you don’t have to spend more for this product. The cover has no sharp edges which help extend the life of your cover. If you need a versatile pool cover, the Aqua Splash is the best option. It makes removal of the blanket effortless. It is designed to fit 16- feet wide pool. This solar pool cover had many convenient features and was manufactured to last. 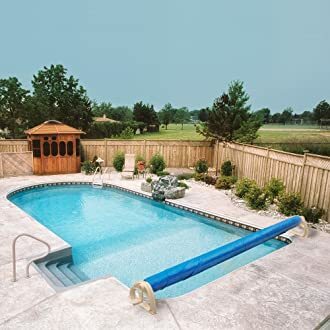 Its unique three-way end design enables permanent placement, mobility, fence mounting, and its taupe shade matches any pool decor. You will notice pre-drilled holes for easy-lock castors. 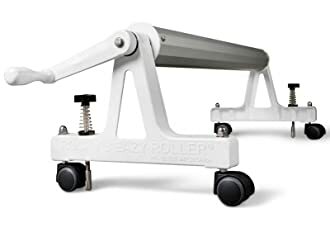 The roller has wide-track bearings to make rolling and turning easy. It offers a three-year warranty. 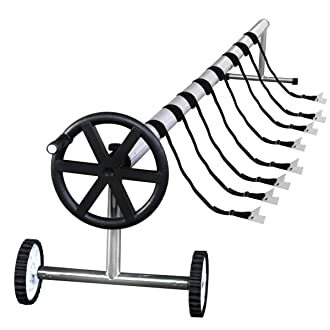 The 21-Feet pool cover reel is one of the newer models in the market. This in-ground solar cover has a thermometer and a sturdy build. 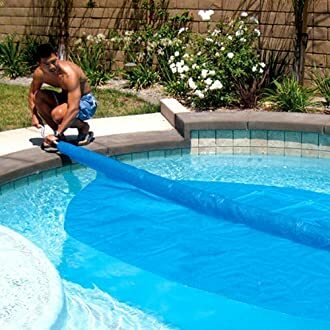 The pool cover has a unique design that lets you unrolling and rolling the cover easily from the pool. The pool shield can be rolled up from the pool by one individual. It is easy to maneuver because it has large threaded tires. This in-ground solar cover can fit 17.5 feet to 21 feet long pool. The reel set includes three poles that are 106.5 inches or 8.875 feet. The Arksen Solar Cover set makes the rolling and unrolling of the cover much simpler. Your pool will benefit a lot from this cover. Aside from keeping the pool clean, it can also keep the water warm. It has five-piece tube set to accommodate a pool up to 21 ft. The cover keeps the debris out of the pool. It also helps keep pool chemicals from evaporating. 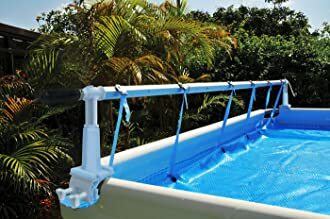 It is designed for pools up to 20 ft. wide. For easy rolling when not in use it has castors. The package includes everything you need to install the solar cover. The reel has robust die-cast aluminum and has baked enamel finish for better durability and quality. It features 3 inches, 12 sided adjustable an-iodized steel tubing to lessen sagging and makes sure of lateral strength. The Solar Roller pool cover can be used both for in-ground and above-ground pool. Rolling starts in the middle which removes the strain off the cover and helps extend the lifespan of the cover. 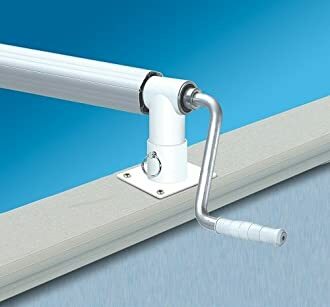 You don’t have to connect anything so there are no holes drilled in your pool or deck and can be removed if not in use. The material can break easily. 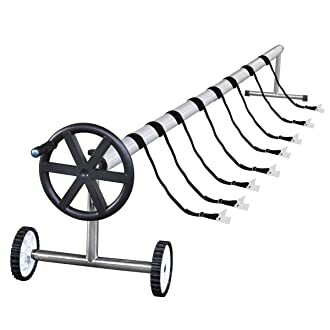 It has an aluminum reel that is designed to be connected directly to the side of the pool. It can cover up to 18.6 feet. The solar cover is anti-rust which makes it last longer. The Kokido Solaris also has a crank to help in rolling up the cover. This above-ground aluminum cover reel is made of high-quality grade aluminum that fits 18 to 28 inches’ width. It is built with sealed, very durable nylon bearings for easy one individual operation. For ease of crank and cover removal, it has a socket mount. It has all the straps needed for attaching the solar blanket. This comes with a 5-year warranty. It requires two individuals to roll it back. 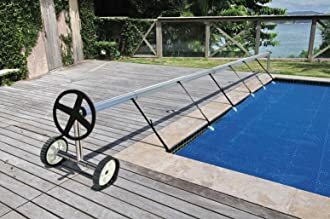 The Doheny’s Deluxe Cover in-ground mechanism is the wheel that can be attached directly to the ground on the pool deck or wall. It can pivot away as the pool is in use. It can cover up to 18 ft. and can be used for round or over leaped pools. This pull cover is reliable and well-maintained. All the products included in this the best pool cover reel review are durable and easy to use. Your choice would ultimately depend on your budget and the features that matter to you (e.g. whether it can help prevent evaporation of pool chemicals). Before making your choice, make a list of the pool you have and consider the degree of insulation you need, as well as how frequently you will need to use the pool cover.